Former Finland technical director Jarmo Matikainen has been in charge of women's and girls' football in Wales for just over a year, and players credit him for changing the face of a game growing in popularity. The Football Association of Wales' Women's Footballer of the Year Jessica Fishlock spent two years in the Netherlands with now-defunct Dutch champions AZ, and says Matikainen has improved the way Wales train, bringing them more in line with European strategy. "He comes in with years of experience. He's been director of the women's game in Finland for years and you don't get that without being good at what you do." Goalkeeper Rhian Nokes added: "Jarmo has linked up with the universities, and sports scientists, so now we get training programmes mailed to us and we do more training camps as well as games. The 51-year-old left his role with the Finnish FA to manage Wales' women's teams at senior and youth levels, as well as developing a strategy for the game domestically. "One day, I hope soon, we'll get the rewards of the work he's putting in," said Bristol Academy player Fishlock. Matikainen's development strategy is strongly linked to the 2013 Uefa European Women's Under-19 Championship, which Wales are hosting. He commented: "International teams are just part of it, we need to look at club structure, grassroots activities and the day-to-day learning environment for talented players. 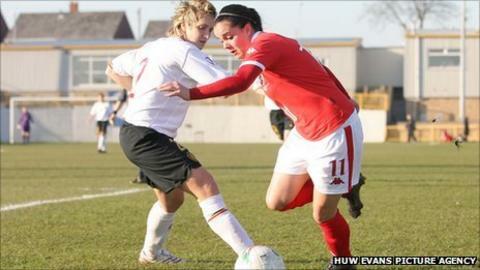 The Finn believes it is key that Wales have as many players as possible exposed to Women's Champions League football. "Even though the lessons are hard, there's no better way to improve and learn about international football," he said. Bristol Academy, Swansea City and Arsenal have all enjoyed Champions League outings this season, each club having strong Wales contingents. Cardiff City Ladies - who play within the English football pyramid - have also represented Wales at Champions League level. The team which won the Welsh Women's Cup - which Cardiff compete in - used to be eligible for Champions League qualification. However the Welsh berth is now awarded to the Welsh Premier League winner. This means Cardiff's only route into European competition would be through the England's Women's Soccer League - and no there will be no promotions to that until 2013. Cardiff club secretary Karen Jones MBE commented: "We had some good tournaments in the last few years, we're disappointed we're no longer able to go." Cardiff keeper Nokes said: "To play three really good games in Europe is great experience. "We used it as our pre-season and then we hit the ground running when the regular season started." Matakainen's main task is to prepare his side for Uefa European Championship qualification in a group which includes France, who finished 4th at the 2011 Women's World Cup. The Wales manager remarked: "I think it's the toughest group in the competition. "We take every game as they come and try to win regardless of the opponent." When you throw into the mix tricky clashes against Scotland it is not an enviable task. "France are one of the best teams in the world at the moment - the football they played at the world cup was brilliant. While success of any development projects will not be noticeable overnight, there are ways to judge how a plan is fairing. According to Matikainen: "There are things we can use to measure our success - for example at the moment we are ranked 29th in UEFA. Then again rankings are rankings - they don't tell the whole big picture." Wales take on group favourites France at the Parc y Scarlets on Saturday 22 October, kick off is 1800 BST. Details of how to follow the action can be found on the FAW website.